(3 Customer Reviews) | Write Review 6 issues per year Geocaching is a real-world treasure hunt that's happening right now, all around you. There are over 6 million geocachers and almost 2.5 million active geocaches. Geocaching is recognised as the fastest growing outdoor activity. You use a GPS enabled device to find hidden containers, which can take various forms and sizes. These can be in some amazing places where you can get out and about exploring. A brilliant way to regain a sense of adventure, get out walking and do some exercise, with the added fun of challenges and technology. 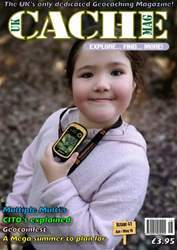 This magazine contains a number of articles written by people who enjoy geocaching and want to share their tales with others, to promote the experience and grow this friendly community. Started over 2 years ago as a printed magazine, this app has been launched to enable an enhanced reader experience with added photos, video and audio. Going digital means you can interact with the magazine and use hyperlinks, with the added fun of challenges and technology. The April May issue of UK Cache Mag. Geocaching is a real-world treasure hunt that's happening right now, all around you. There are over 6 million geocachers and almost 2.5 million active geocaches. Geocaching is recognised as the fastest growing outdoor activity. Geocaching can take you to interesting ruins, places of outstanding natural beauty or of local interest. This makes a brilliant hobby for young and old alike, and you can do it on your own or with family and friends. You'll receive 6 issues during a 1 year UK Cache Mag magazine subscription. Good Geo Caching Mag, also good for novices. I started to read this excellent magazine half way through its current life but I quickly bought the back numbers! Each issue is full of inspiring articles and full to the brim with enthusiasm that can only inspire Geocacher's everywhere to get out there in the great open and discover yet more places they never knew existed. And it gets better with each issue too. Having been a subscriber from issue one of this magazine. I have watched it grow over two years, from its first beginnings to what it is now. A very interesting, enjoyable and interesting magazine aimed at the geocaching community, with a variety of articles to suet all, from the beginner through to the seasoned cacher. The editor (Adam) welcomes articles written by cachers for publication in the magazine. All in all a very good read. You'll receive 6 issues during a 1 year UK Cache Mag magazine print subscription.